Dr. Siddhi Aryal represents QED in the Asia region and provides strategic planning and technical leadership in the areas of health systems strengthening and capacity building. He comes to QED after having worked with a number of international development organizations, including Malaria Consortium, Pact and FHI360 in regional management and technical roles. Dr. Aryal brings more than 16 years of experience in directing and leading donor-funded health systems strengthening (HSS) programs and service delivery programs in the Asia and Africa regions. He brings a depth of expertise in technical leadership in the areas of health system strengthening, capacity building and monitoring and evaluation complemented by hands-on management of complex regional health programs. As a skilled leader, he also offers expertise in strategic design, planning, stakeholder coordination, and project management. He has worked closely with national, provincial and district government counterparts, working in partnership to develop strategic plans, operational frameworks and key policies to improve the overall health system. As a seasoned project director, he is well versed in program leadership and has directed regional health programs with budgets of up to $20 million and more than 17 sub-grantees from multiple donors including USAID, DFID, CDC, Chevron and GFATM. Dr. Aryal is a skilled facilitator and relationship builder – he has brought together multi-partner forums with representation from civil society, development agencies and governments bodies. 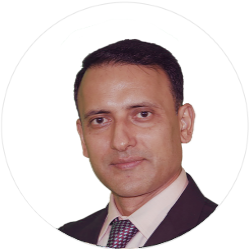 Dr. Aryal has a PhD in Global Health Systems Development from Tulane University, New Orleans, USA (2015) and a MSc in International Health, joint degree from University College London in London, Queen Margaret University, Edinburgh and the University of Copenhagen, Copenhagen (2007).